It’s no longer a secret that South Walton is home to perhaps our country’s most beautiful and coveted beaches, but it’s also home to many of the South’s most acclaimed artists. 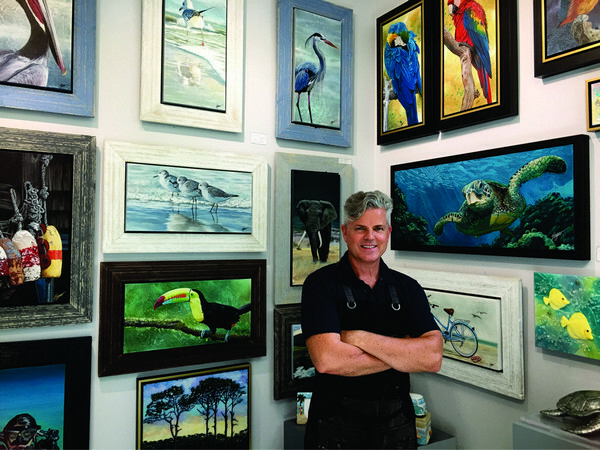 Recently, Grayton Beach welcomed world-renowned artist Clint Eagar and his working studio at Clint Eagar Designs located in Uptown Grayton Circle. When you first walk into Clint Eagar’s gallery, you might wonder how many artists have their work featured here due to the varied techniques and mediums that range from sculptures, 3D canvases with detailed glass incorporation, breathtaking modern and abstract art, home décor and acrylic landscapes painted so precisely they will have you wondering if you are looking at a painting or a photograph. However, the answer is only one. Clint’s eclectic works incorporate a broad spectrum and are about as diverse as his upbringing. Clint was raised and educated in South Africa he’s really from just about everywhere. Born to a middle-class family with tendencies to move frequently, Clint became of age during the turmoil raging in South Africa. In the late 70’s attended the Johannesburg School of Art, where his talents were further developed with formal training in sculpting, drawing, painting and mixed media. After graduating in 1981, he moved to the states and settled in Dallas where there was a support system of other South Africans who had fled the country to escape the escalating violence back home. His next adventure found Clint travelling to Scotland, where he enrolled in the Advertising and Design program at the Fashion and Arts Institute, where he was awarded a scholarship his creative achievement. Clint became involved with several businesses after college, always as the lead designer, but the first was Frontline Graphics based in San Diego. They put Clint Eagar on the map, you might say. By the age of 23, his work was internationally published. Frontline Graphics began selling his originals and his lithographs in Japan, Scandinavia, Australia, western Europe and the US. “I was young then, but I was starting to realize I was making the owners of the company a lot of money,” he said. Clint was starting to think about going out on his own. At the time the biggest gift and home décor company in the country, Figi Graphics, reached out and offered him the position of Director of Product Design and Development. He was 25 years old and living his rendition of ‘the dream’. He had a gorgeous office overlooking the San Diego bay, a great salary, and free reign of his creative powers. He had a large staff of artists working for him from all different backgrounds. He redesigned a lagging line for Figi that generated millions in sales for the company. “By the early 90’s, Figi was sending Clint to Asia to launch and manage production in factories in Taiwan. Still on salary and recognizing the growing industry in Taiwan and China, Clint made the move to Taipei and set up his own design company. He was all of 27. He landed his first account shortly thereafter for a large picture framing company in Texas, and it wasn’t long before he was doing industrial designing for several large companies in the consumer products area. He stayed there until the mid-90’s before he realized if he wanted to develop his international design and art consulting company, he would have to move back to the states. “Many headquarters of the companies I worked with were in Chicago so it seemed to make sense to be closer to the customer,” Clint recalled. It proved to be a very good move for Clint. He was able to build up his customer base with very successful importers, including, Pier 1, Stein Mart, CBK, Ganz, K – Mart, Wilton Industries, JC Penny, Kirkland’s Home Stores, Venture Stores, Disney and Costco and others. Clint’s International Trading and Import / Export company expanded and became very established. He opened a major office and showroom in China, with a staff of 110 and a 35,000 sq. ft. facility. Business was booming and he expanded his design consulting and services to Europe and landed many accounts in the UAE, as well, mostly home décor stores, gift shops, and lighting studios. As I listened to a truly amazing story, I had to ask how this internationally known artist and world traveler found his way to Grayton Beach? “well, my wife, Effie and I visited a friend in Destin a few years ago and, in the matter of a few days we were in love. Chicago’s cold you know”, he said with a chuckle. Clint and Effie bought property in 2017 and opened Clint Eagar Designs in Grayton Beach. Clint loves that some parts of our area remind him of the beauty of South Africa where he grew up. “It’s just so comfortable here, we love the gentle laid-back lifestyle”, he said. The Eagar’s are settling in, enjoying all the natural beauty our area has to offer. Working on 30A has inspired Clint to get back to his painting roots, where he spends most of his time in his studio in the back of the gallery. He’s still working with a few favored corporate companies on the side, Z Gallery for one, a personal favorite, as well as other national accounts. Come see his gallery in Uptown Grayton Circle. I promise you, you will be glad you did. The are many amazing artists around the area, but it’s not often you get to see a master of the craft like this. I dare say, Clint Eagar may be the most talented painter around, but you’ll have to decide that for yourself. Clint Eagar Designs is located in Uptown Grayton Circle, just behind Cracking’s restaurant. 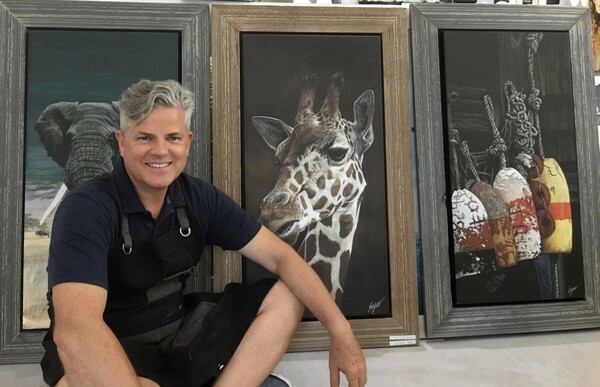 In collaboration with “Theo of South Walton” and the Friends of South Walton Sea Turtles, clint created a painting of Theo is developing a “Theo” peoductline, which will include the painting, Christmas ornaments, A Theo Pillow and of course, the classic plush turtle. Proceeds all go to support the educational mission of the Friends of South Walton SeaTurtles. Pick up your Theo today! Check out Clint Eagar’s website at www.clinteagardesign.com. 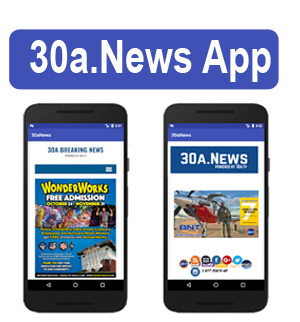 The post Spotlight on Clint Eagar and Eagar Design Studios appeared first on South Walton Life | 30A News, Events and Community Information. Be the first to comment on "Spotlight on Clint Eagar and Eagar Design Studios"